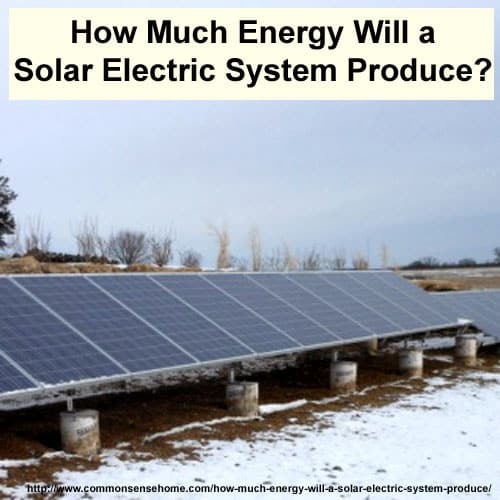 How Much Energy Will a Solar Electric System Produce? You are here: Home / Green Home Building / How Much Energy Will a Solar Electric System Produce? This is a guest post by Jerry Noel. In this article we’ll answer the question “How Much Energy Will a Solar Electric System Produce?” (projected solar electric system output) along with the anticipated short-term financial savings and long term return on investment (ROI). In Part 1 (Solar Electric Basics), Jerry discussed the three predominant questions of solar power: cost, batteries, and “DIY”. Part two provided Emergency Power Options. Article 3 discussed three types of home solar power projects and how to mount your solar panels. 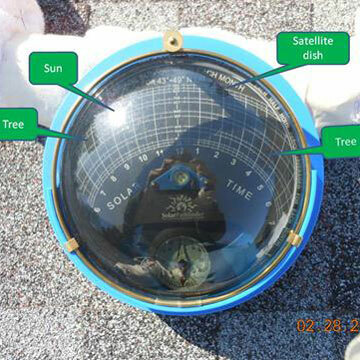 Article 4, Solar Site Check, demonstrated how to analyze your location for best panel placement. Article 5 focused on designing your solar electric system, specifically, getting the most out of your available space. The National Renewable Energy Lab had compiled data for the last 30 years to create a chart that shows the expected amount of sunlight for the entire US. This chart shows that the Madison, WI area can expect to receive 4.5 to 5 “peak sun hours” per day at any given location. The intensity solar radiation which is normally in the shape of a bell curve (low in mornings and evenings) has been squared off to give an even measurement of 1000 watts per meter-squared. This is why you had to pay attention during calculus class! As with any projection, some years might be sunnier or cloudier. The software computes the total amount of sun-hours available based on the location zip code and generates a report shown below. There are up to a dozen different items to list, but I pared it down for simplicity. 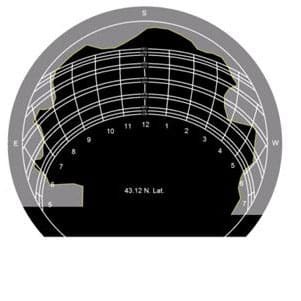 Given the shading, azimuth of 180°, and tilt angle of 20° the system will operate at 93.5% of total production for this area. Using the value of 15 cents per Kilo-Watt-Hour from Madison Gas & Electric the system will save $339 per year. By playing with the parameters in the software, if I change from 20° to 30° tilt the system will now perform at 95.6% and return $346 per year. That 10° extra tilt returns only $7 per year yet will cost much more to install due to the extra supports to offset the extra wind loading on the roof; more proof that it is best to keep the array parallel to the roof. If you don’t have access to the Pathfinder software or that from another solar site assessment such as Solmetric, you can still get a good “ball park” estimate. 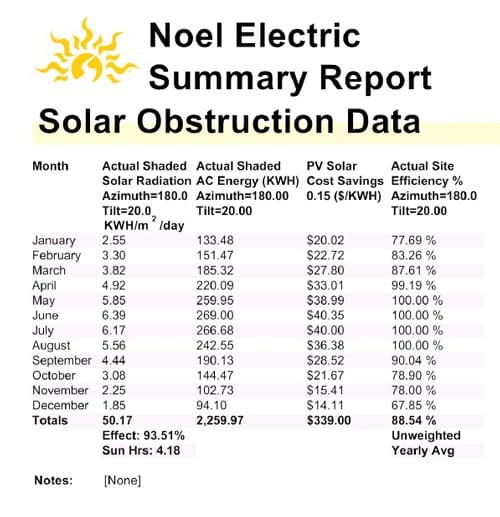 The U.S. National Renewable Energy Lab (NREL) has a free online tool called PV Watts that is easy to use to calculate production and payback. Version 1 is the easiest to start using; you pick your state and the closest city to your location. Pay attention to climate as well. Just because you live closer to Milwaukee, the Madison climate may be closer to yours because of the effect of Lake Michigan. Then enter the DC value of the solar modules you want to use. The “Derating” menu is used to adjust from ideal conditions. Industry standard is to leave it at the default of 77%. If you know your shading this is where you enter it. You can also use this to adjust future annual production down by ½% due to aging of the modules to see future production. The bottom box is where you enter your cost from the utility. Here is where you can also adjust the values for future increases in cost due to inflation, etc. How Much Does a Solar Electric (PV) System Cost? There isn’t an easy answer for this question, just approximations using other installs in the area. No solar array is like the next one, unless it is on an identical site by the same company. Contractors have different labor rates and some components cost more than others. Using the common number of $5 per watt installed, this system of 6-300 watt modules with a Kaco inverter will cost roughly $9000 before incentives if you hire out the entire installation. The $5 per watt is down from $8 per watt only three years ago. By splitting up the components and shopping online the Helios modules would cost approximately $2200, $2000 for the Kaco inverter, $1000 for aluminum mounting rails and roof flashings, and another $200 for electrical conduit, wire, fasteners, etc for a grand total of around $5100. It will take three workers to install the modules, two is possible but lifting the modules onto the roof would tax even the most experienced professionals. Figure in roughly $250 per worker per day (plus pizza and beer) if they are doing you a favor, $300+ if you they work for a contractor that provides benefits. Three people should easily get the rails and modules mounted in a day. That leaves one electrician to install the inverter, run the conduit, mount the utility required exterior disconnect, pull the wire, and play around in the electrical panel for one day. Yes, this is electrical work; an electrician is a requirement (mandatory in some areas) if you want to pass the inspections or stay alive. What Financial Incentives are Available for Solar Electric Systems? The US Department of Energy has Database of State Incentives for Renewables & Effciency (DSIRE). The DSIRE site has listings for federal and state for renewable energy as well as energy efficiency. Federal benefits are broken down to commercial and residential benefits. For my system, I qualified for a 30% income tax reduction. This was after all other benefits and reimbursements are paid out. The 30% of the net cost will be deducted from your federal tax due. If the amount exceeds your tax liability, the remainder will be carried forward. To see current programs check out the dsire maps website. In Wisconsin, I qualified for the state sales tax exemption for equipment purchased. Wisconsin Focus on Energy has a program for renewable energy. For photovoltaic systems (solar electric) the rebate was $600 per Kilowatt installed. My 1.8KW system returns $1080. My $9000 system cost me just over $5500. Another benefit is the property tax exemption. If you install a $20,000 system on your residence, the assessed value increases by the $20K, but the taxable value exempts the solar portion. Research federal and state programs, they are changing regularly. What's the Payback Amount/Time on a Solar Electric System? Remember the economy of scale from economics class? This is a small system so the payoff is longer; larger systems return their investment faster. Most utilities are required to offer what is commonly called “net metering”. Net metering means that your meter runs forward when you use power, and runs backward when you produce more than you use. Some utilities offer a bonus for producing power, a “feed-in-tariff”. Madison Gas and Electric and Alliant Energy here in southern Wisconsin have this type of program. You buy electricity at the standard rate of 14 cents per KWh and sell what you produce back to them at 25 cents per KWh. This accelerates the payback time substantially for larger systems. The drawback is the initial cost is higher since the residence must have a second electric meter to monitor the amount produced. This could add $500-$700 to the initial cost because an electrician needs to replace the existing electric meter with a dual meter pedestal. As metering technology improves (smart meters), this requirement could very well go by the wayside. You will need to contact your local power company to confirm details on any programs they may have. My assumptions are for 14 cents per kilowatt-hour charge from the local utility which is what I pay. I know people that have “time of use” metering. Those people have a higher electric rate during the peak demand times during the day, and lower ones in the evenings and weekends. Those situations are ideal for solar electric systems! When you are gone to work and the home is empty (assuming you don’t work at home or home school), the electricity produced will be at the peak demand rate. My next article will focus on our new house. It has a larger roof area so I can do a larger system design and projection. Depending on the economy and work conditions, we may put a system on this fall or next spring. Autumn installs have the advantage of a quicker 30% rebate from the Feds while the spring ones benefit from having a full summer the first year.